This sentiment is echoed in other industry surveys of national employers as well. 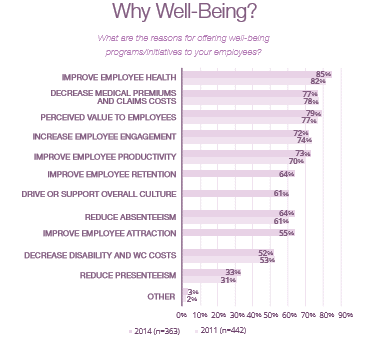 The 2015 WorldatWork study finds 96 percent of organizations support well-being initiatives, with 74 percent of organizations planning to increase their wellbeing offerings in the next two years. 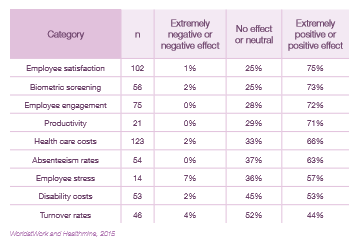 According to the study, employers’ top objectives are improving workforce health, impacting health-care costs, increasing productivity and driving overall culture (WorldatWork and Healthmine, 2015). Any one of these objectives or a combination of several may motivate companies to make changes; but regardless of the reason, focus on company culture can take many forms. Many organizations have a solid foundation on which to build, such as firm leadership commitment, a comprehensive and robust benefits package or generous employee flexibility. From a solid foundation, organizations can begin to develop a clear vision of what they want their culture to reflect, how it should support the needs of their workforce, and what bottom line goals they want to achieve. The well-known research firm Gallup has demonstrated in its well-being research that companies with engaged workers have significantly higher productivity, profitability, customer ratings, less turnover and absenteeism, and fewer safety incidents (Gallup, 2013) – all critical to organizational success. With more than 1,000 national employers surveyed, the Families and Work Institute determined that effective employers recognize employees’ personal and professional lives are both sources of strength and challenges that can affect work outcomes. According to the authors of the study, by creating effective workplaces where processes and infrastructures address stressors and enhance employee performance and well-being, employers will be able to continuously reinvent their workplaces so that their people and their organizations can thrive (K. Matos, 2014). The benefits of cultures of well-being can be realized in many ways as the moving parts come cohesively together. Those companies with stronger-than-average cultures marked by strong leadership, company reputation, focus on performance and employee engagement drive higher overall engagement, revenue growth, productivity and shareholder value. (AonHewitt, 2014). It doesn’t all have to happen at once. Building a successful culture takes time, commitment and a well-prepared plan. In creating your road map, begin with the end in mind, set forth well-defined targets and identify the paths you must create to achieve them. You can’t change what you don’t measure, so be sure data is integrated and metrics are aligned with the overarching organizational objectives. Don’t let the lofty goals prevent you from beginning your journey. Take inventory of what is already working, then build upon those successes to further enhance the culture of your organization today. Contact Employers Health to help prepare the road map for identifying and capturing success metrics as you work to build a successful culture of engagement in your organization.